One of the most common requests Dr. Stewart and Dr. Hull get from their dental patients is whiter teeth. We are happy to say that our Belmont, Comstock Park, Grand Rapids, Sparta, Walker and Rockford, MI dental patients are in luck when it comes to teeth whitening, because cosmetic dentistry procedures like teeth whitening and veneers are safe, effective, and affordable. Some patients might be interested in bleaching their teeth at home. We offer a very safe and effective home whitening system that allows you to whiten your teeth at your convenience at home. 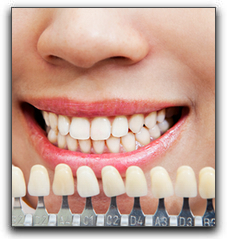 We also offer in-office teeth bleaching which can often be done in one visit. Grand Rapids residents who do in-office bleaching appreciate the care that is given to protect the soft tissues of the mouth from the bleaching agent. As you can see, there are a lot of great ways to keep your teeth nice and white here in Rockford, MI. If you’re interested in any of these whitening methods or a complete smile makeover, please call Stewart and Hull Aesthetic and General Dentistry at 616-784-2377 and ask about our KöR whitening, Zoom whitening, or home whitening. Our friendly and thorough staff will schedule a cosmetic dental consultation at your convenience.